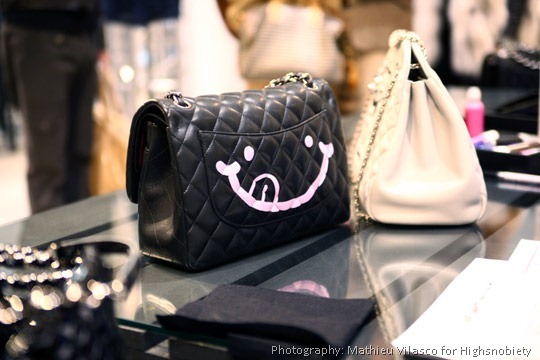 On March 1, 2011, Kevin Lyons customized Chanel handbags at the CHANEL-COLETTE ephemeral boutique, rue Saint-Honoré, Paris for the opening of its Pop-Up shop. On display were an assortment of classic Chanel products, such as quilted bags, leather gloves and various apparel. 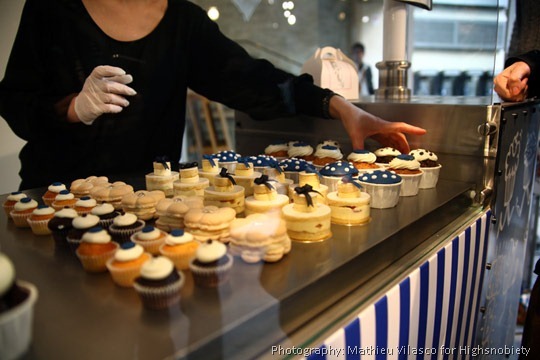 Guests were treated to cupcakes,(this image had to make it in this post) and artist Kevin Lyons, who recent held an exhibition at the shop, was on hand customizing bags and adding Chanel influenced imagery to the space. Kevin Lyons is a 1992 graduate of the Rhode Island School of Design in the USA where he received a degree in film. Typographer, Art Director, designer and teacher, he was named as one of “The Top Forty Designers Under Thirty” by I.D. Magazine. His work has been published worldwide from Thrasher to The Face, to Lowdown to Anthem and Refill. He has shown worldwide including solo shows in Philadelphia, Los Angeles, San Francisco, Tokyo, and Paris.